Serve this masterpiece at your next family gathering! You'll enjoy the wonderful combination of the sweet glazed topping and hickory smoked flavor of our spiral sliced ham with the flavor enhancing bone left in. It's fully cooked and spiral sliced for your serving convenience. Thaw in refrigerator for 24 to 48 hours. 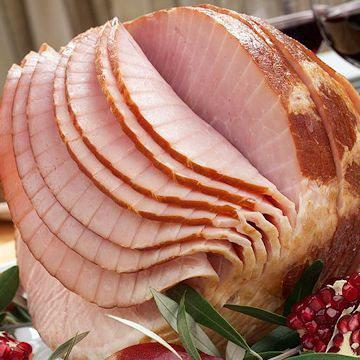 Spiral Sliced Ham is fully cooked making it possible to serve directly from the refrigerator. Oven: preheat oven to 325°F. Remove Spiral Sliced Ham from film and foil. Place ham cut side down on a raised edge baking pan lined with foil. Heat, uncovered, for 60-75 minutes for entire ham or 10 minutes per pound for smaller portions.